with the same Google Account you’re using for Google Now on Android or iOS. To learn more about Google Now notifications in Chrome and how to configure your settings, please visit the Help Center. If you’re not already using Google Now on Android or iOS, head over here to get started. 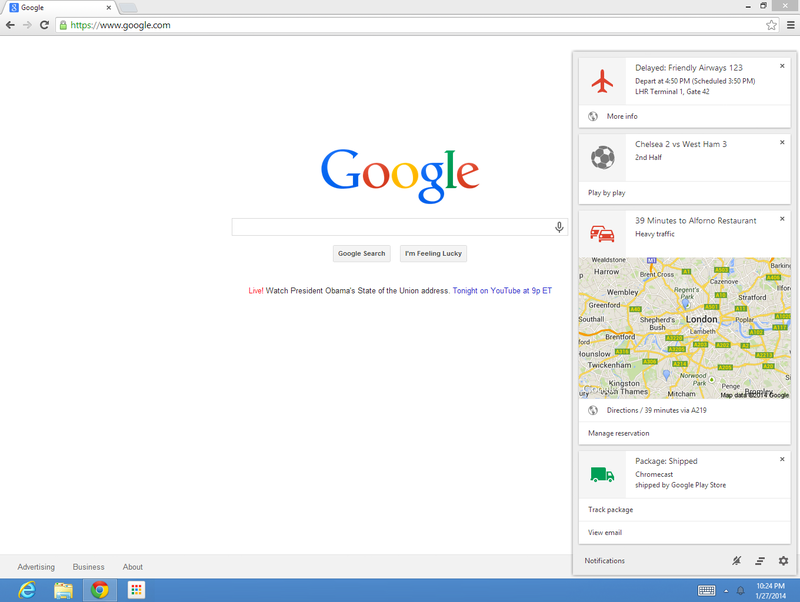 Google Now notifications in Chrome will just be available in English initially, with other languages supported soon. Let us know what you think in the comments! Update 3/24/2014: Starting today and rolling out over the next few weeks, Google Now users in all languages will be able to get these notifications in all channels of Chrome. To enable this feature, simply sign in to Chrome with the same Google Account you’re using for Google Now on Android or iOS. Your friend Steve’s flight from New York is delayed by an hour. Your favorite soccer team is up by one point with two minutes left. Your Chromecast has just shipped. If you're using Google Now, you'd already know all of that information without having to ask. Google Now already gives you the right information at the right time on Android and iOS. Starting this week, if you’re using Chrome beta, you will be able to receive your Google Now notifications via the notifications center on your Mac, Windows or Chromebook computer. To enable these notifications, simply sign in to Chrome with the same Google Account you’re using for Google Now on Android or iOS.